An arbitration hearing was conducted June 19, 2002 at the Office of Collective Bargaining, Columbus, Ohio. The parties provided the arbitrator with a stipulation stating the issued to be: “In accordance with Article 20, Section 20.08 (8) of the Collective Bargaining Agreement the parties submit the following statement of issue for resolution by the Arbitrator. 1. Is the Electronic Technician 2 (52472) classification entitled to Step 6 in Pay Range 10? 2. If so, did the Employer violate Article 60.06 of the labor agreement by not advancing the Grievant to Step 6 in Pay Range 10, and what shall the remedy be? A. Class base rate is the minimum hourly rate of the pay range for the classification to which the employee is assigned. B. Step rate is the specific value within the range to which the employee is assigned. C. Base rate is the employee's step rate plus longevity adjustment. D. Regular rate is the base rate plus supplements, whichever apply. E. Total rate is the regular rate plus shift differential, where applicable. Notwithstanding any other provision of this Agreement, if these definitions lead to any reduction in pay, the previous application shall apply. Employees in the bargaining unit shall be paid in accordance with the following schedule effective with the pay period which includes the first full pay period in October 2000. The effective increase for al pay ranges shall be 3%. Employees who are promoted within the unit shall be placed at a step to guarantee them an increase of approximately four percent (4%), except as otherwise provided in Section 60.06. An employee shall receive a step increase upon satisfactory completion of the probationary period. Step increases shall occur annually thereafter if the employee receives an overall "satisfactory" rating on his/her annual performance evaluation. If the employee's performance evaluation is not completed on time, the employee shall not be denied a step increase. 52451 Highway Patrol Communications Technician 1. Employees whose classifications receive a pay range reassignment shall have their salary adjusted in accordance with Section 60.06 of this Article. All Highway Patrol Dispatcher 1 '8 with two (2) years seniority shall be promoted to Highway Patrol Dispatcher 2. All employees effected by such promotion or upgrading shall be placed on that step of the new pay range that is equal to the employee's present rate of, if none exist that are equa1, then the next greater amount. Only disputes involving the interpretation, application or alleged violation of a provision of this Agreement shall be subject to arbitration. The umpire shall have no power to add to, subtract from or modify any of the terms of this Agreement, nor shall the umpire impose on either parry a limitation or obligation not specifically required by the language of this Agreement. This Agreement is a final and complete agreement of all negotiated items that are in effect throughout the term of the Agreement. This Agreement may be amended only by written agreement between the Emp1oyer and the Union. No verbal statements shall supersede any provisions of this Agreement. Fringe benefits and other rights granted by the Ohio Revised Code, which are not specifically provided for or abridged by this Agreement, shall be determined by those applicable statutes, regulations, rules or directives. The parties agree that they will negotiate any changes to wages, hours and terms and conditions of employment. as may be required by law. The parties presented witnesses who explained the history of bargaining surrounding this issue. Documentary evidence was presented and subsequent to the hearing, each party submitted a post-hearing brief in which they argued their respective positions. All testimony and materials, along with the closing briefs, were reviewed and considered by the arbitrator in reaching this decision. In that this case deals with a matter of contract interpretation, the union assumed the burden of proof and presented its case first. This case concerns the classification of Electronics Technician 2. There are approximately forty persons in this classification. While the grievant in this action is Dale L. Flanigan, this is an “et. al.” grievance and thus the award will apply to all others similarly situated. The Electronics Technician 2 is assigned to District Headquarters locations and the Columbus Headquarters. They have the responsibility to install and maintain various pieces of electronic equipment utilized by the personnel of the Ohio State Highway Patrol. This equipment includes radios, sirens, citizen band units, blood alcohol computers, radar units, videotape equipment and emergency public address systems. Historically these persons have been compensated on “Pay Range 10” of the employer’s pay tables. There were five “steps” available for ET 2’s. Highway Patrol Troopers were also included in the Pay Range 10 category. During the negotiations for the current collective bargaining agreement the Union sought upward reclassification of all its members. The parties proceeded to fact-finding and the fact-finders report was soundly rejected by the union membership. The statutory conciliation process began with mediation. During these discussions it was agreed that the Employer would conduct a classification review. While some misunderstanding occurred regarding which classifications would be reviewed, the results of the study determined that Troopers, Sergeants, and Dispatchers would receive a pay range increase. The Union assumed the new pay ranges would mirror existing State ranges bearing the same numerical designation. The State assumed the new pay ranges would be negotiated. The parties proceeded to negotiate the implementation of the Classification Review. Again negotiations seemed to reach impasse. In order to break the deadlock the Director of the Office of Collective Bargaining, Steve Gulyassy, and the Executive Director of the Union, Jim Roberts met. The Union contends the language is clear and unambiguous. Only ET 2’s remain in Pay Range 10 and that pay range includes a sixth step. It was noted that DAS read the language the same way. ET’s who qualified, began to receive the Pay Range, step 6, amount. This payment was discontinued when the State Highway Patrol called DAS and told them to correct the payment. The Union also notes that a posting for ET 2 listed the Pay Range, Step 6 amount as the maximum payment for the position. Subsequently a correction was offered. The new posting did not correct the supposed error. The Union argues the Parol Evidence rule applies in this case and urges the arbitrator to disregard the historical and intent testimony offered by the employer. The Union offered testimony by Mr. Roberts, that Mr. Gulyassy affirmatively agreed to leave the Pay Range 10, Step 6 for ET 2’s as a part of their negotiations. was provided as a seniority step for Troopers in previous Collective Bargaining Agreements and the fact it was left after the Troopers were moved to Pay Range 11 was merely an error and the Employer should not be required to pay for something that was clearly in error. Let us first turn to the Union’s view that the Parol Evidence Rule.applies. Arbitrator Walter N. Kaufman comments on “Parol Evidence” in a 1999 case. The Employer does not advance the argument that the language is ambiguous but rather notes that the pattern of circumstances led to contract wording which points to an unintended result. It is true that the history surrounding these negotiations is complicated by the complexity of state government. The classification study was conducted totally independent of the persons who bargained the contract. As a result, further negotiations were necessary to implement the results of that study. Those negotiations led to the memorandum of understanding which, in essence, modified the Collective Bargaining Agreement. 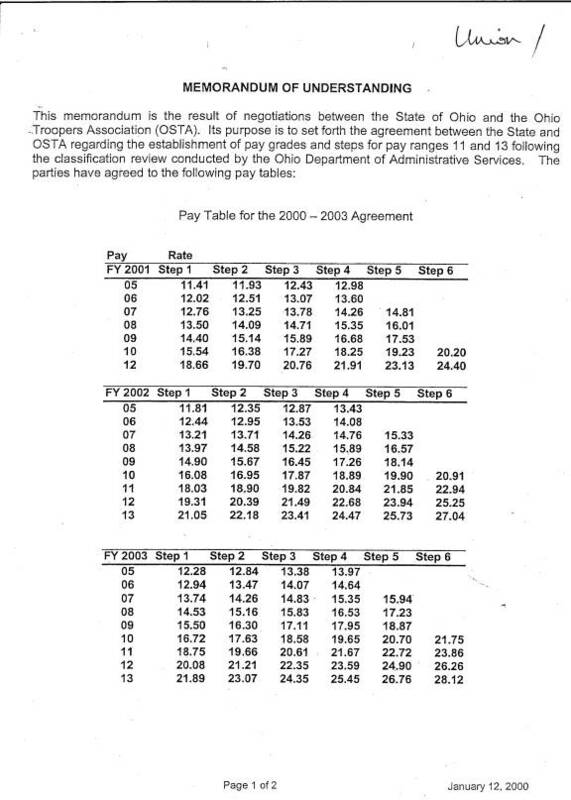 The Highway Patrol contends that all of this action allowed step 6 of Pay Range 10 to stay in the contract when it was never intended to be available for ET 2’s. In essence, it is their contention that the continued inclusion of Step 6 was a mistake. OSTA Executive Director Roberts testified that the inclusion was not a mistake but part of a deal struck between himself and OCB Director Gulyassy. Director Roberts is a veteran Labor Relations Professional who brings a record and reputation of personal integrity to the witness stand. His testimony stands unrefuted. The employer attempted to continue the hearing in order to attempt to reach Mr. Gulyassy and obtain his testimony about the negotiations between himself and Director Roberts. This Arbitrator denied that request. In addition to the lack of certainty about reaching Director Gulyassy, his testimony would likey not be persuasive in this matter. Director Gulyassy’s testimony would either support that of Director Roberts or his would disagree. If he were in agreement, that would add nothing to the current case. If he disagreed then that would mean there was no bi-lateral intent regarding the language. The lack of bi-lateral intent sends the arbitrator back to the clear language of the agreement. While I am not convinced that the employer has established that a mistake was made, lets assume for a moment, that there was a mistake. In order to prevail over plain language a mutual mistake (emphasis added) must have been made. In a United Steelworkers case Arbitrator D.L. Howell defines a “mutual mistake” and cites other cases that illustrate the same point. The testimony does not support that a mutual mistake was made. 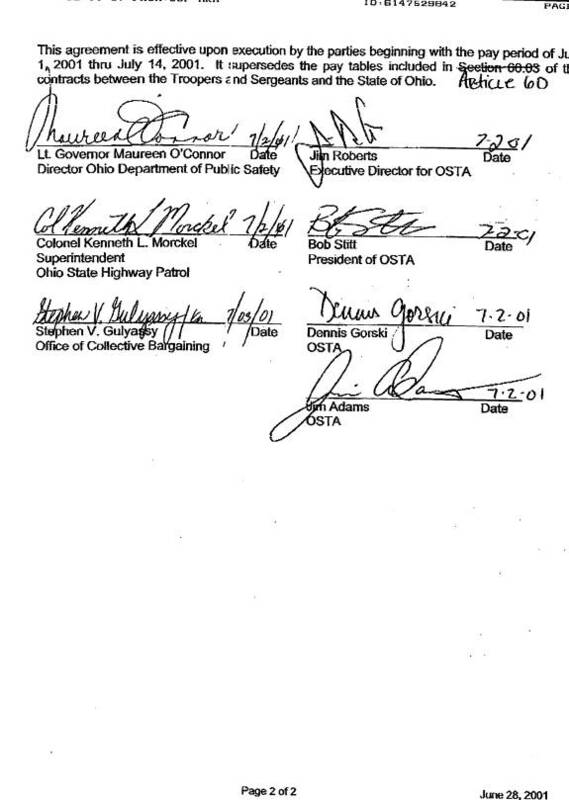 It is clear the Ohio State Highway Patrol feels a mistake was made but there is no evidence that the Office of Collective Bargaining feels that there was a mistake. For these reasons I agree with the Union. The Patrol Evidence Rule does apply. While the testimony and arguments about bargaining history were instructive and necessary to understand this matter, they do not provide a basis for the Arbitrator to “reform” the written agreements in affect. Let us turn to the interpretation of the language of the Collective Bargaining Agreement and the Memorandum of Understanding. The Employer’s own witness, Dan Santry of DAS testified that he read the language and believed the Electronic Technician 2’s were entitled to Step 6 of Pay Range 10 and made those adjustments until instructed by Highway Patrol Administrators to discontinue the action and correct the believed overpayments. Someone within the Highway Patrol also apparently made the same interpretation when a Posting Notice was issued for a new Electronic Technician 2. The plain reading of the Collective Bargaining Agreement and the Memorandum of Understanding indicates that there are six steps in Pay Range 10. The only employees compensated pursuant to Pay Range 10 are Electronic Technician 2’s. Therefore those who have met the requirements of the necessary longevity and satisfactory evaluations are entitled to receive step 6. Arbitrator D.L. Howell, in another case noted that an arbitrator cannot reach beyond the plain language. Based upon the language of the Collective Bargaining Agreement and the Memorandum of Understanding the only possible interpretation is to grant the grievance. For the reasons herein stated, the grievance is granted. Electronic Technician 2’s shall be entitled to Step 6 of Pay Range 10 upon meeting all other contractual requirements. Pay for those so qualified shall be retroactive to the effective date of the MOU or the date thereafter when the ET 2 meets the necessary qualifications. Issued at London, Ohio this 7th day of August 2002. In re ST. CROIX [V.I.] ALUMINA L.L.C. and United Steelworkers of America, Local 7701.